cPanel is well known within the IT and business world as an easy way to manage your business’ website but also its emails. With its intuitive user interface and wide range of powerful features, web and email hosting via the online cPanel platform is a great way to keep on top of your companies digital presence. When it comes to email hosting, there is one little-known but very effective feature your business should be using in cPanel – plus addressing. If you have never used this feature before for email hosting in cPanel or its associated Web Host Manager function, then it may sound complicated. Don’t worry – it really is not! In simple terms, plus addressing ensures you and your employees’ email is delivered in such a way that incoming mail is better organised. It can also be known as sub-addressing – both terms basically mean the same thing. As an example, if your email address is Dave@madeup.com, your plus address version could be dave+tasks@madeup.com. The key thing to note is the + symbol and the word ‘tasks’ which we added into the plus address version. This allows your email software to pick up on the formatting and deliver any incoming mails addressed in this way to a ‘Tasks’ folder you would have set up. The best and most usable function of this feature is how it allows you to better organise your email inbox. If, for example, you signed up for a business mailing list with an online networking provider, you could create an email address in a format like dave+businessevents@madeup.com. When you start to get mail back from the networking provider, your cPanel server will place all messages in a mailbox folder created for them automatically. What are the specific benefits of using plus addressing? We have looked at what this feature brings to your email hosting and what it does for your business in general. But what specific benefit does it offer? For most business owners and their staff, coming in each morning to an inbox packed full of messages that might not be important is a real pain. Using plus addressing helps you all to ditch this clutter and keep your mailbox free for messages about your work. By keeping incoming mail organised in relevant folders, it keeps your mailbox clutter free. Of course, the big bonus with a cleaner, less cluttered mailbox is that you will get more done. Many hours are wasted each working week by people having to first read and then manually move incoming messages that may not be needed or important. By making sure only key work messages come directly into your main inbox, you are able to work smarter and get more done. Of course, the other messages that you have used plus addressing for are still there. They are just organised better to help increase productivity and workflow. 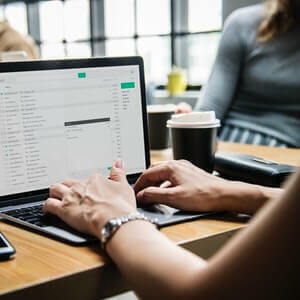 Many businesses now suffer from signing up to mailing lists and then seeing their email being sold on without their permission to other sites. This can result in a flood of unsolicited emails that clutter up your inbox and could also be loaded with dangerous viruses. By using plus addressing, you can easily spot unsolicited emails that are replying to your plus email address rather than them going into the relevant folder. The best way to access the very useful plus addressing feature is to sign-up for an email hosting package that allows you to access it. Here at catalyst2, we have a choice of superb email hosting packages that support plus addressing along with a host of other awesome features. Browse our website today for more details or give us a call to find out more.